This month a one-of-its kind homeless shelter will reach one year in operation. The L. Minor Care Center is not only shelter, but also provides help to homeless men who have mental or physical disabilities. KANSAS CITY, Mo. 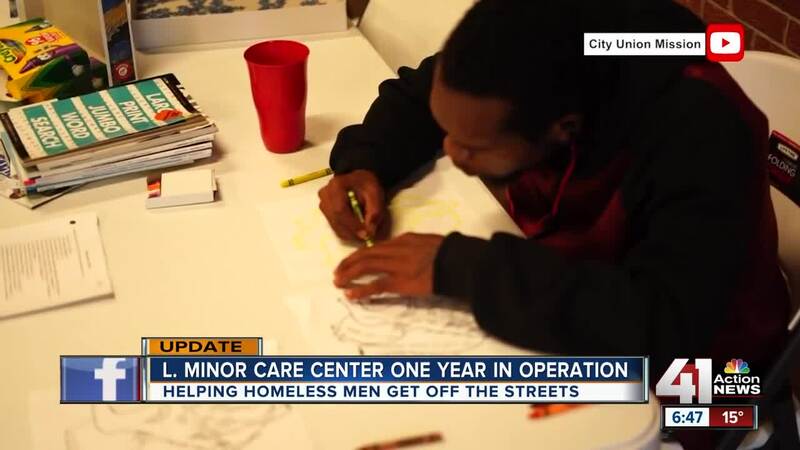 — This month a one-of-its kind homeless shelter will reach one year in operation. The L. Minor Care Center is not only shelter, but also provides help to homeless men who have mental or physical disabilities. The City Union Mission already operates two homeless shelters. It opened the L. Minor Care Center because it saw an unmet need in the Kansas City metro. Their goal is to get elderly men, or men with physical and mental challenges, off the streets and help them find and use tools to succeed on their own. Administrators estimate about 25 percent of the homeless population fall into that category. The L. Minor Care Center team partners with community agencies to provide individualized care and group classes such as art therapy. Perhaps most importantly, the shelter gives men a structured life. “We really want [the clients] to be the ones that kind of drive the ship, we want to see what they feel like they need, what they feel comfortable with, and just work with them,” said Amanda Greene, the center’s administrator. The shelter can hold 35 men at once, but averages closer to 20. They stay as long as they need to find their success. Greene highlighted one success story about a man finding structure, sobriety, and a full time spot at an assisted living facility. “His case manager visits him every few weeks and he’s always told us to tell everyone at the mission 'Hi,' but he’s glad that he’s where he’s at. So it’s been very fulfilling to see him make progress,” Greene said. Donations fund the L Minor Care Center, which is located next to City Union Mission at East 10th Street and Forest Avenue.